Beijing Olympic Gold Medal winner, James DeGale, and current British and Commonwealth super middleweight boxing champion George Groves, have known each other since they were kids. Both trained since childhood at the Dale Youth Boxing Club in Grenfell Tower, and both found fame as champions thanks to the excellent training and support they received at Dale throughout their formative years. Along with many others who live on Lancaster West Estate, we in the Grenfell Action Group are immensely proud of the achievements of the Dale Youth Boxing Club. Lancaster West has been home to Dale Youth since they were forced to move from their old premises next to Avondale Park many years ago. 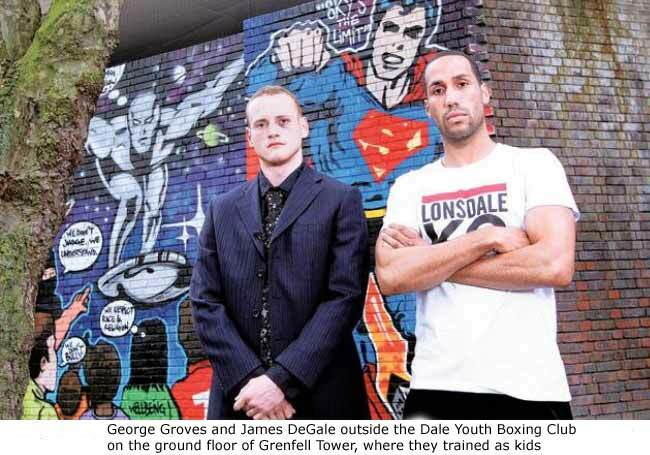 The gym is situated in the base of Grenfell Tower and, through its work with young boxers, Dale Youth has been a positive force in the community and has helped local children and youth channel their energies and find focus in life. Grenfell Tower is about to undergo major refurbishment work, and with the imposition of the KALC development on the surrounding Lancaster Green site, life will never be the same for this community. Despite these changes, it seems that the future of the prestigious boxing club will be safe on our Estate. Initially there were plans to move Dale Youth into the garages adjacent to Grenfell Tower. This was until it was pointed out to the planners that the concrete ceilings of the garages are too low to accommodate a boxing ring and standing fighters. Now it seems that the powers that be have set space aside on one of the lower floors of the refurbished Grenfell Tower and this will house Dale Youth in the years to come. This is excellent news, but it got us thinking. With the Grenfell Tower planning application proceeding through Council like an unstoppable juggernaut, where will the boxing club be temporarily housed when building work commences early in 2013? Let’s hope that the Council and the TMO have got this covered, and that Dale Youth will be able to continue training our future champions without disruption.